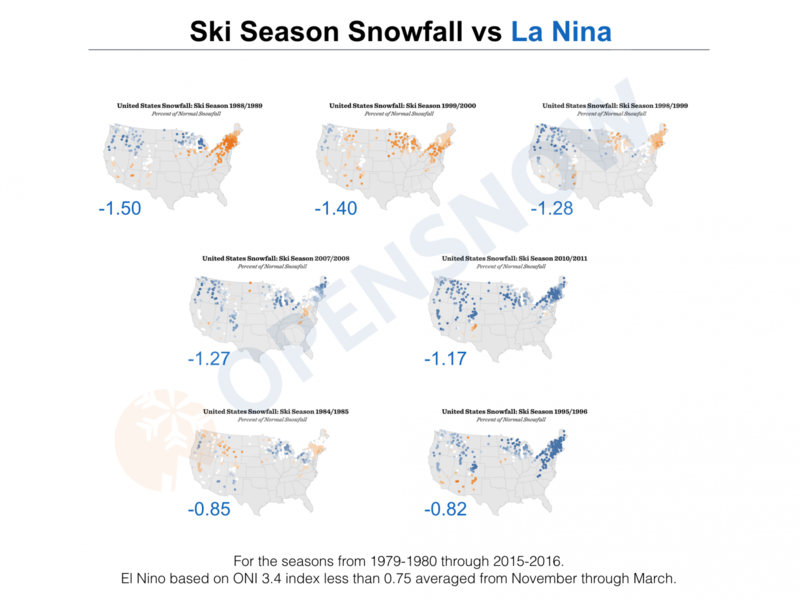 How El Nino, La Nina, and the Pacific Decadal Oscillation influence snowfall in the United States. Unfortunately, it's complicated. During the late summer and early autumn, myself and most other die-hard skiers tend to let their thoughts drift to the possibility of future powder days. This day dreaming usually sparks questions about how the weather pattern will behave during the upcoming season. In this article, I will discuss a few things that meteorologists look at to help forecast weather patterns 3-6 months in the future, and we’ll see if these factors can help us to figure out how much snow will fall this winter. Before getting to the details, I want to state up front that 3-6 month forecasts are generally inaccurate. Meteorologists across the world are working to improve these forecasts, but at this point in 2016, I would not make large bets based on monthly forecasts. To forecast weather patterns months into the future, we look at the temperature of water in ocean regions across the world. We do this for two reasons. First, the water temperatures influence the initiation of storms and how they track. Second, water temperatures are somewhat easier to predict than temperatures on land because large bodies of water take a long time to heat up or cool down. During the last few decades, scientists have found that the water temperature in many ocean regions oscillate between times of warmer-than-average water and cooler-than-average water. Often, scientists name these flip-flopping patterns oscillations, and give them a specific name in each area of the world. 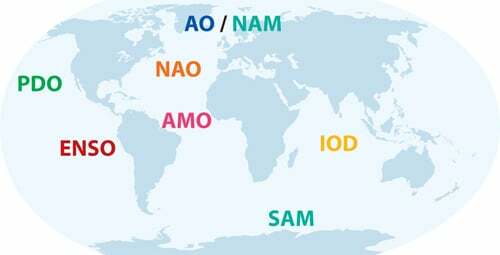 The map below shows the abbreviation and location for most of these oscillations. Two of the most important oscillations, the ones that play a major role in directing weather patterns across the United States, are ENSO and PDO. The water temperatures in the central and northern Pacific Ocean help to influence weather patterns that eventually affect the storm track over the United States. It’s this storm track that controls which regions get the most snow. The PDO describes water temperatures in the northern Pacific Ocean. The image below shows a positive PDO, or warm PDO, with warm ocean water temperatures along the west coast of North America and cooler temperatures in the northwestern Pacific. A negative PDO is the opposite pattern. ENSO is the technical term for El Nino and La Nina. The image below shows a positive ENSO, or warm ENSO, known as El Nino, with warm ocean water temperatures extending west from South America. A negative ENSO, or La Nina, is the opposite pattern. 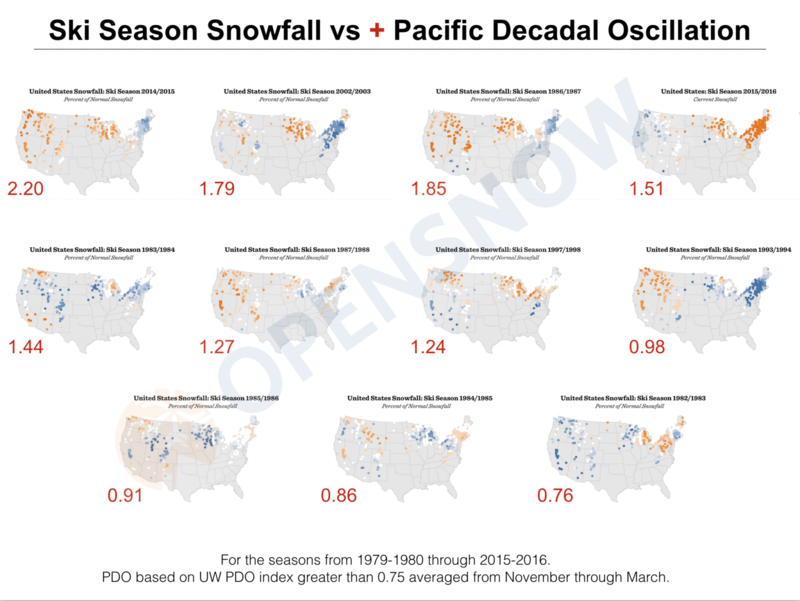 Life for a meteorologist would be much easier if there were perfect correlations between PDO, ENSO, and snowfall in the United States. If that were the case, whenever there was a strong El Nino, La Nina, or strongly positive or negative PDO, we could whip out our handy chart of correlations and know which areas of the country would see the most snow. Unfortunately, while both the PDO and ENSO play a role in determining the winter weather pattern, neither can perfectly predict the winter’s snowfall. During the 37 winter seasons between 1979-1980 and 2015-2016, we have experienced about 7 winters with significant El Ninos. The map below shows the snowfall during these 7 winters, along with the strength of the El Nino (higher number = stronger El Nino). There are some patterns evident here, with somewhat below average snowfall in the northwest US and above average snowfall in the southwestern US, but this pattern doesn’t hold 100% of the time. Source: OpenSnow.com. Blue = above average snow, white = near average snow, and orange = below average snow. The map below shows winter snowfall during 7 significant La Nina episodes (negative ENSO) between 1979-1980 and 2015-2016. The effects of La Nina appear to be a bit more stable, with the western US seeing average to above average snow during most of these seasons. Again, though, the pattern doesn’t hold 100% of the time. 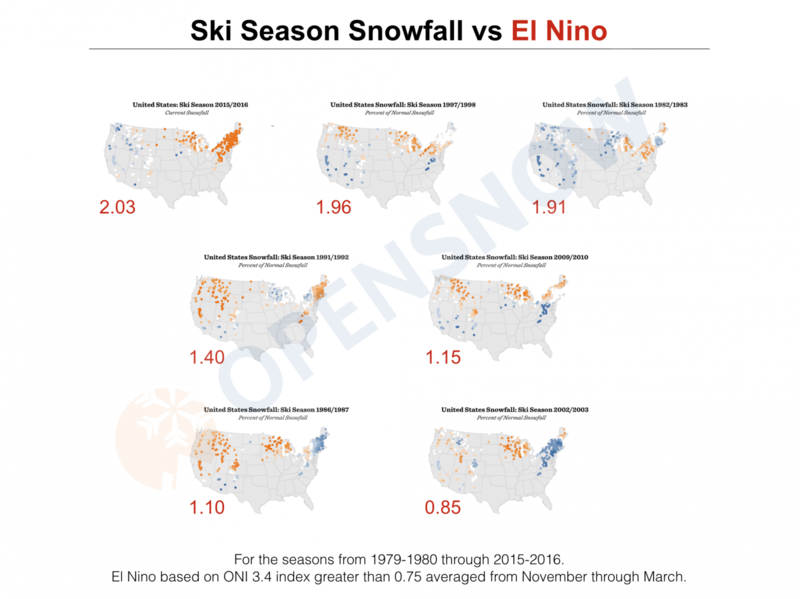 The maps above show ENSO’s influence on snowfall in the United States. While helpful, ENSO doesn’t correlate perfectly with snowfall. Let’s move on to the PDO. 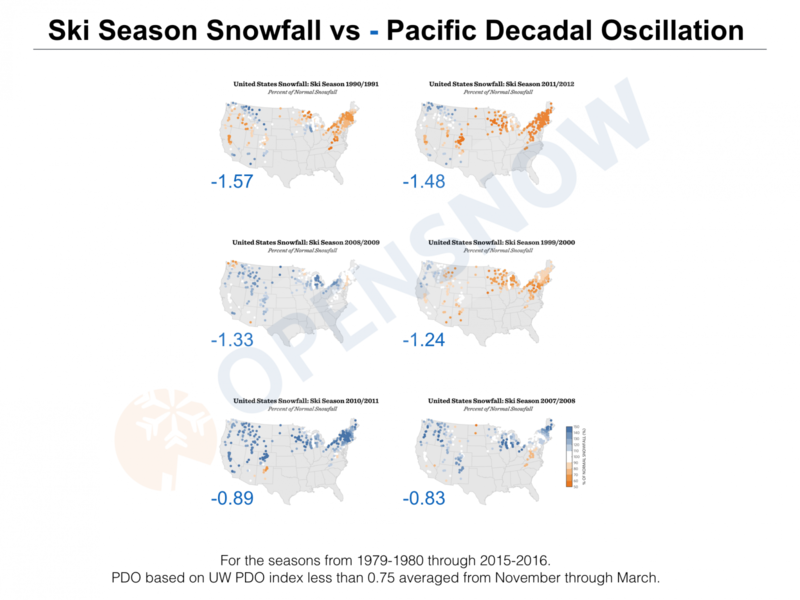 Can we detect a more stable correlation between the phases of the PDO (positive or negative) and snowfall in the United States? Not really. Let’s look at the maps. Below you’ll see 11 seasons during which the PDO was significantly positive (warm water along the west coast of North America, cooler water in the northwest Pacific Ocean). Snowfall in the western mountains was below average during 4 of these seasons, above average during 3 seasons, and near average (as a whole) during another 4 seasons. In the northeast, 5 winters were above average, 5 winters were near average, and 1 was below average. The PDO seems to be a better predictor in the northeast than in the west. BUT, the one below average season in the northeast was last season, 2015-2016, which is a recent reminder that every year is a bit different. And finally, let’s look at 6 recent seasons with a negative PDO. The western US saw great snowfall during 3 seasons with the other seasons netting out to average (with some regions getting heavy snowfall and some getting below average snowfall). In the northeast, 3 seasons were below average, 2 were near or just above average, and 1 was stellar. Again, not a perfect correlation. While ENSO and the PDO exert a strong influence over the winter weather pattern in the United States, alone, neither is a perfect predictor of where the snow will fall. 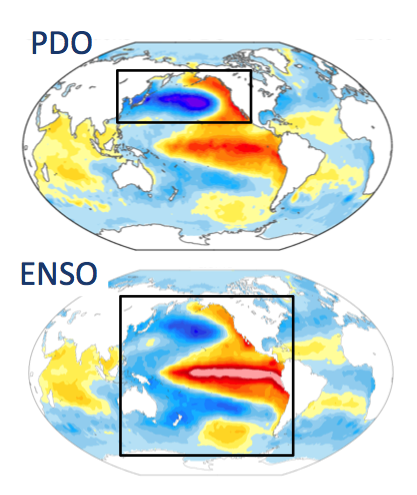 To create a 3-6 month forecast with a better chance of some accuracy, we need to analyze the combined effect of ENSO and the PDO, and also consider a few more factors in the mix. We’ll talk more about these other factors in a future article. Since you made it this far through a geeky weather article, you must love powder. Since that’s the case, something that you might find helpful during your quest for powder during the upcoming season is to upgrade to an All-Access Pass for OpenSnow. Being an All-Access member gives you access to our 10-day forecasts, time-lapse webcams for tracking exactly when fresh snow has fallen, and the ability to receive custom alerts to know when powder days are approaching. All of this costs just $19 for one full year (365 days). In other words, one year of getting the best information about powder will cost you about the same as you’ll spend on one lunch at most resorts. Keep dreaming of future powder days!